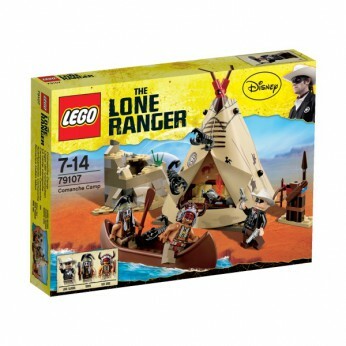 LEGO Lone Ranger Comanche Camp features teepee, weapon rack, canoe with oar, and rocky outcrop with scorpion attack function. Includes 3 minifigures with weapons…. Journey to the Comanche Camp with the Lone Ranger and Tonto to visit Red Knee in his teepee. Check out the weapon rack then jump in the canoe and go fishing, but watch out for the scorpions as they launch a surprise attack. LEGO model number: 79107: Includes the Lone Ranger, Tonto, Red Knee, a teepee with removable canopy and campfire, a weapon rack, a fish, 3 scorpions, 3 bones and a canoe. For ages 7 years and over; EAN: 5702014972537. WARNING(S): Not suitable for children under 3 years old. To be used under the direct supervision of an adult. Journey across the Wild West to the Comanche Camp with The Lone Ranger. Join Tonto and the Lone Ranger as they visit Red Knee in the teepee. Share stories around the campfire, then jump in the canoe and go fishing. But watch out for the scorpions as they launch a surprise attack from the rocks! This detailed Lego set features 161 pieces and includes: 3 Mini figures: the Lone Ranger, Tonto and Red Knee Teepee with entrance flap and removable canopy Weapon rack Weapons: 2 revolvers, tomahawk, spear and a bow with quiver Canoe with oar Rocks with scorpion attack function Accessories: Fish, campfire 3 scorpions and 3 bones Great for kids aged eight and up. This toy costs approximately £19.99 (for the latest and best prices make sure you check our retailer list for the LEGO The Lone Ranger Comanche Camp 79107 above). In our review of LEGO The Lone Ranger Comanche Camp 79107 we classed it as being suitable for ages 6 years, 7 years, 8 years, 9 years, over 10 years but recommend you check the manufacturer specific advice before purchasing.